Blog about Cydia tweaks, themes, Cydia apps, list of updated Cydia sources, latest iphone hacks and crazy tricks you can do with your iOS devices. With the big screens of iPhone 6 and iPhone 6 Plus it has become very difficult to operate keyboard with one hand. Though you can see more text, images and videos but you can't type with one hand. iPhone 5s was used to have a 4 inch display but the new models of iPhones come with 4.7 and 5.5 inch displays that makes it difficult type with one hand. Hence to solve this problem and make the typing experience better Cydia developers have come with an awesome tweak, HandyKey. HandyKey is a customizing Cydia app that lets you change iPhone keyboard size. Here I have shared some unique features of Handykey and how to change iPhone keyboard size using HandyKey Cydia app. Just download this Cydia app and get back your old iPhone keyboard. HandyKey resizes the iPhone's keyboard so that typing with one hand becomes easy and simple. You can add some tools at the sides where space is left. Add emoticons, smileys etc. You can swipe the keyboard from right end to left end or keep it at the center. Swipe it with two fingers to change the keyboard layout. 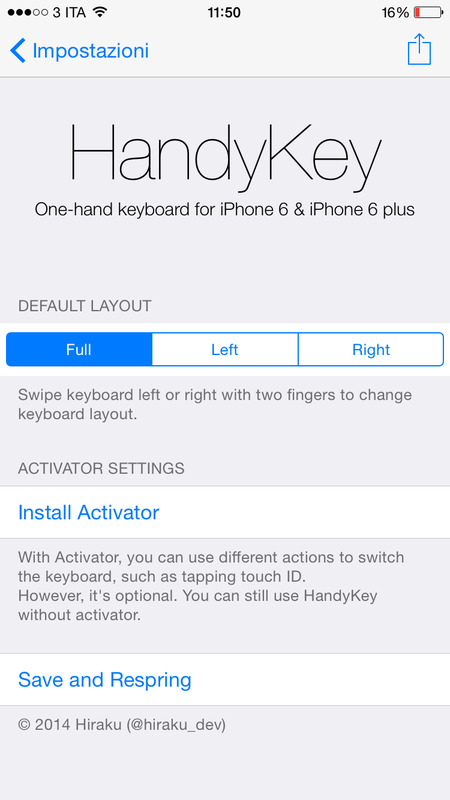 HandyKey supports activator Cydia tweak. To change the layout of keyboard you can set custom actions using activator and instead of swiping you change it to double tap or something else. However there are few limitations too. HandyKey works only in portrait mode. It works only for those apps that support native iPhone 6 and iPhone 6 plus resolutions. HandyKey Cydia app doesn't work with apps that need root access of Cydia, iFile etc. Hence if you have installed any rare app and you find difficulties it might happen that the app is demanding root access and thus will not be supported by HandyKey. And you have to use the keyboard layouts offered as HandyKey doesn't supports third party keyboards. All in all HandyKey is awesome if you are a regular messenger user, a WhatsApp freak who uses Watusi or a talkative texter. You can download HandyKey from Cydia for $0.99. Step 1 - Tap on Cydia icon on homescreen and open it. Step 2 - In the search box, search for "HandyKey". And Tap on "HandyKey" from the search results. 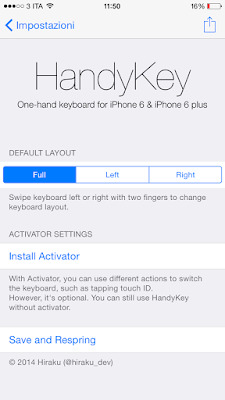 Step 3 - Make sure the version of HandyKey is compatible with iOS 9. Then tap on the install button. HandyKey is now successfully installed on your iPhone. So this was a simple tutorial on how to change iPhone keyboard size using HandyKey Cydia app. 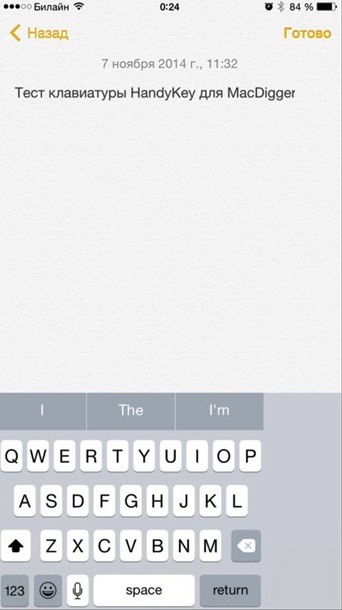 Just resize the keyboard on your iPhone 6 and iPhone 6 plus and keep texting (with one hand) ! Check out the top Cydia apps that will blow your mind and enhance your experience by exploiting the iPhone's potential. Use Cydia and install these ultimate free cracked apps, themes, wallpapers, customizing apps, tweaks, games, premium themes etc. Cydia Unlocks © 2015. Simple theme. Powered by Blogger.